Endocrinologists, by tradition, think of disease in terms of hyper- or hypofunctioning of glands. The soundness of this “old-fashioned” thinking has been established repeatedly; type 1, insulin-dependent diabetes mellitus (IDDM) exemplifies this. Indeed, complete agreement exists that IDDM is the consequence of severe insulin deficiency caused by B-cell destruction. Doubt that the situation is as simple in type 2, non-insulin-dependent diabetes mellitus (NIDDM) was voiced as early as 1936 , and gained momentum after the studies of Yalow and Berson , when it was shown that plasma insulin in NIDDM could be as high as in control subjects. Since then, numerous studies have confirmed these observations and shown that the plasma insulin values after an oral glucose load or following meals are often higher in NIDDM patients than in controls [3–5]. These observations led to the logical hypothesis that NIDDM is due to resistance to the action of insulin, rather than to reduction in insulin secretion . 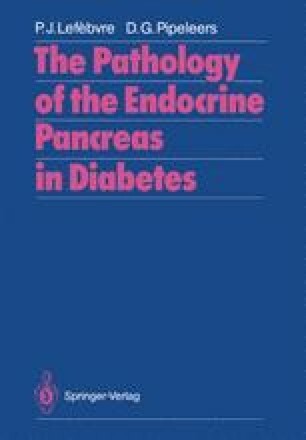 Many studies over the past decade, mainly employing the euglycemic clamp technique, have indeed demonstrated that sensitivity to insulin is reduced in lean as well as obese NIDDM patients [for review see 7, 8]. Studies performed during recent years in my laboratory were mainly supported by the Yad Hanadiv Foundation and the Juvenile Diabetes Foundation International.